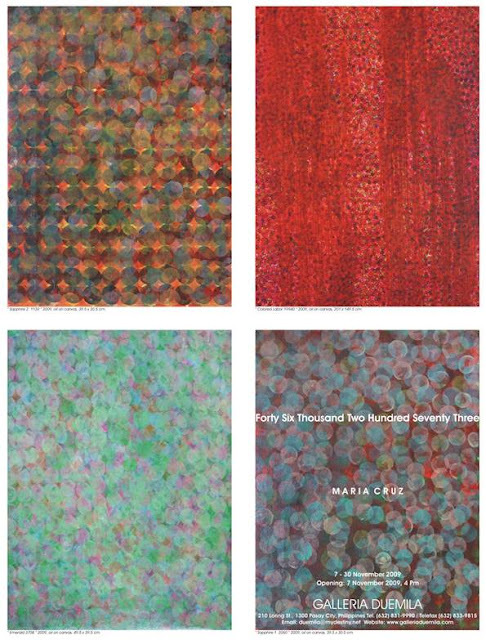 Among the most thoughtful artists of the country is Maria Cruz. Standing out for her luminous inquisitions, her philosophies of worth and value manifest themselves in her creative process. Slated to open on November 7, 2009 at the Galleria Duemila, Forty Six Thousand Two Hundred Seventy Three is the artist’s most recent exhibition featuring her mixed media coin paintings. The title is in fact, the total number of coins that Maria has used in creating her pieces. To date, the coins have collectively amounted to 373, 264. With titles like Emerald 3708, Sapphire 1 2060, Coal 2306 and Ruby Riot 17120, the works evoke notions of how worth and value flourish after tedious work- what is precious is undoubtedly cradled by one who has put in considerable amount of time and effort into actualizing it- if not everything into it. In turn, select works display the physicality of such precious stones, like Sapphire 1 2060, which possesses a translucent quality, as if one was looking into the shimmer and shine of a gem. Coolly hued, the coins create a pattern that echo blurred spectrums of soft light. On the other side of it, a larger work, Ruby Riot 17273 emphatically suggests the heavier, more aggressive tones of Maria’s philosophy through the bold crimson coloring that stir up images of a gushing waterfall- or blood. In laying out such a potent dichotomy, the exhibition is poetically laden with the layers that Maria distills through her artistic tangential perspective. Born in Manila, Philippines, Maria studied Fine Arts in the University of Santo Tomas before transferring to the Sydney College of Arts where she completed her degree in Visual Arts. She pursued her Post-Graduation studies at the Art Academy of Duesseldorf, Germany with Prof. Klaus Rinke. Maria holds a Masters degree in the Visual Arts from The University of Sydney. Currently based in Berlin, Maria has shown extensively all over the globe, including Australia, Germany and the United States. Still managing to keep close ties with Manila, she has shown at the Ateneo Art Gallery, Pablo Gallery (Fort), and has regularly mounted shows at Galleria Duemila. A deeply accomplished artist, Maria has been a recipient to numerous residencies and grants in Australia as well as winning the Portia Geach Memorial Prize for Portraiture in 1997. In 2004, she was awarded the Asialink Grant and in the following year, she received the Karl Hoffer Gesselschaft International Studio Program in Berlin. A significant notable in her list of achievements, Maria was awarded the prestigious 2000 PS1 International Studio Program in New York. Extending her creative endeavors to teaching, she has been an art lecturer in various universities in Australia. She is represented by Kaliman Gallery in Australia and Galleria Duemila in the Philippines. ““Forty Six Thousand Two Hundred Seventy Three” will have an opening on November 7 at 4:00 PM and will run until 30 November 2009. For more information, contact Galleria Duemila through Tel. No. (+632) 831-9990 or Telefax (+632) 833-9815, e-mail: duemila@mydestiny.net or visit our website at www.galleriaduemila.com. The gallery is located at 210 Loring Street, Pasay City.